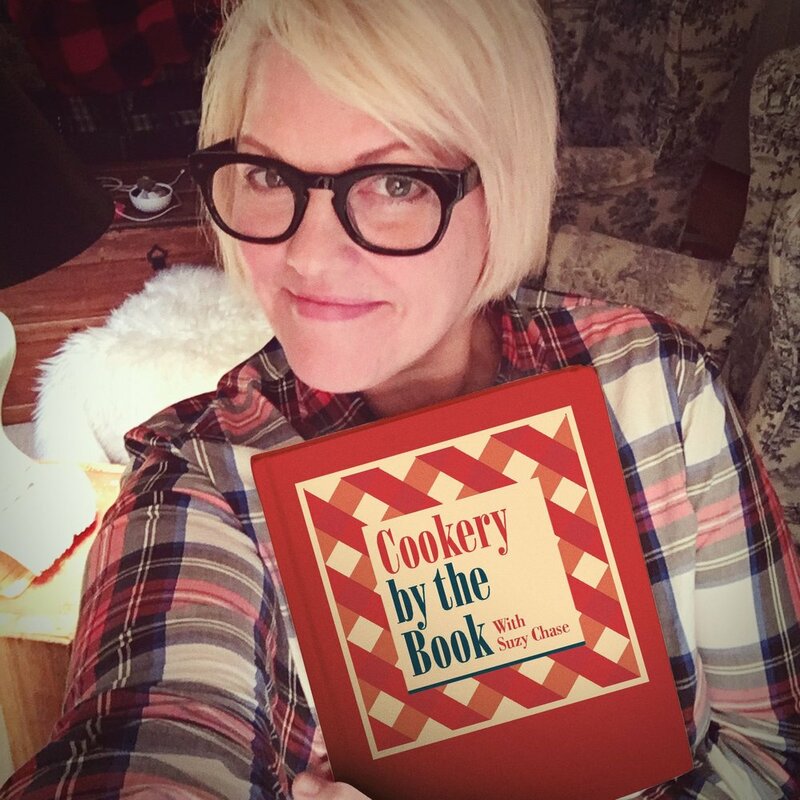 Suzy Chase : Welcome to the Cookery By the Book podcast with me, Suzy Chase. J. M. Hirsch: I'm J. M. Hirsch. I'm the food editor for the Associated Press, and my cookbook is Beating the Lunch Box Blues. Suzy Chase : Beating the Lunch Box Blues is an idea book to inspire anyone daunted by the daily ordeal of packing lunch for yourself or your kids. I love this idea because I rarely see a lunch specific cookbook. Tell us about your cookbook meets flip book approach. J. M. Hirsch: I wanted to create a book that worked the same I way I work in the morning, which I wake up, I have my coffee, I try to get my kid dressed, and then I try to see what's in the refrigerator that I can quickly and easily assemble. I wanted a book that kind of reflected that feel because that's the reality for everybody in the morning. I wanted a book that was dominated by visuals, something that you don't really need a recipe for the most part. That you can just look at a picture, get an idea and say, "I can do this. I've got this," or, "I can substitute that." I didn't want people to feel hemmed in by my ideas or my recipes. I wanted each page to just be almost a jumble of ideas because what my kid eats or what I want to eat for lunch isn't going to be what somebody else's kid wants. I didn't want to prescribe particular lunches. I just wanted to offer up tons of ideas that you could just flip through, look at it and say, "I'll combine that with this. I'll do that. I'll grab some of this," and just get a lot of ideas. I wanted the kids to be able to flip through it as well and just point at things and say ... Let's face it. When we're talking about kids, there's not a whole lot of attention for the detail of recipes, and so it's not like these kids are going to say, "Daddy, can you please make me some quiche today, and this is what I would like in it, and can you use this recipe?" I just wanted to point at pictures and say, "Hey, how about this?" That reflects the way people actually operate in the morning. Suzy Chase : Let's start off with planning tips. Should we plan weeks worth of lunches, or do you recommend doing day to day? J. M. Hirsch: I plan nothing. I mean, I don't even plan tomorrow's lunches. I have nothing but admiration for people who can plan a week's worth of meals, any meal, it doesn't matter which, or people who frankly are every so slightly insane and cook a month or plan a month of meals ahead of time. God speed to them. I just could not possibly do that in my life. The very simple technique that I use which is hardly brain surgery is the night before at dinner whatever I'm making, and I never decide what I'm making until about five o'clock at night. Whatever I'm making, I make too much of it. Doesn't matter if it's chicken or steak or pasta or veggies. Doesn't matter. I just make too much of it, because it's simple. It's not extra work for me to roast a slightly larger chicken or boil up a little extra pasta or make a slightly larger batch of chili. It's no extra work for me. Then, now I throw those leftovers in the refrigerator, and the next morning I have the building blocks of a good lunch. That is my number one tip. Just cook too much at dinner because that's going to get you rolling the next morning. The other thing I suggest especially when you're dealing with kids is to save the green bean battles I call them for another time. Lunch is not the time to try to impose eating ideas on kids. You're not there to model the good behavior by eating your green beans. Your kids are sitting next to their snot-nosed friends and they're going to be more influenced by what their friends bring for lunch than what you packed them for lunch. I say have the kid flip through books like this and come up with ideas, but it needs to be a very simple process. Just have them list the sorts of lunches they like. You're going to get a lot more buy-in from doing that. On the other had, the flip side of that tip is that I do not believe that lunch is a democracy. I'm not willing to spend half an hour every morning negotiating what I'm going to pack. In fact, I have never once asked my son what he wants for lunch. I go into the refrigerator, I see what I've got. I say, "Well, all right. I can make him a steak wrap, or I can make him do-it-yourself tacos or something like that." I know he'll eat it, but I'm not going to spend half an hour in the morning negotiating it because he's a kid, and given a choice he's going to make a bad one, or he's going to want to argue with me, or he's going to say, "I don't want steak today. I want this." Then, you get into the back and forth. "Well, we don't have this. How about that? How about this?" Who has the time for that in the morning? Involve them but again lunch is not a democracy. Suzy Chase : Back to the dinner thing. I noticed that you have 30 recipes specifically designed for dinners in the cookbook. J. M. Hirsch: Yeah, and again I really did not aggressive did not want lunch recipes because again that's just not how we make lunch and pack lunch. What I wanted to is give some recipes that you could make for dinner, and the recipes are designed to make too much food. If you follow the recipe, you're going to have enough to feed ... most of them feed four people for dinner and then have enough for two or three leftover servings. You get things like a bacon cauliflower mac and cheese, and it's this delicious mac and cheese. You make it for dinner the night before. It's got veggies built into it and it's really tasty. Then, the next morning you could pack some leftovers straight up in a thermos but add a bunch a sides that you can toss with it, that you can sprinkle over the mac and cheese. One of my son's favorite things is take the leftover and now cold mac and cheese and cut it into slices because it gets really solid, and put it between slices of bread and make a grilled cheese sandwich. There's all sort of things like that that are easily repurposed. Chicken is obviously a no-brainer. Everybody cooks chicken usually at least once or twice a week based on the volume that Americans eat of chicken. It's such a no-brainer to repurpose cold or hot. You can toss it with anything. I mean, it's so simple and so ... I wanted to just give a couple of basic recipes for dinners not so much to say, here, you should only be making these dinner recipes, but just to help people get in the mindset of okay, just cook whatever I want for dinner and just make too much of it. Even if you're following recipes that aren't designed for this, it's usually pretty simple to scale it up a little bit just to make ever so slightly more, especially things like chilis and soups and things like that. Then, again you're already half-way to a packed lunch the next morning. Suzy Chase : In terms of packing it, how do we keep our hot things hot and our cold things cold? J. M. Hirsch: ... at school and hurl them across the school yard? J. M. Hirsch: I want lunch equipment that is going to survive my son. If don't go that, then I go in the opposite direction and just buy the cheapest disposable Tupperware type stuff, because then when it gets lost, who cares? You can usually get it at the dollar store really cheap. They will lose it of course. Regardless of that they're made out of, I believe in having lots of little containers because it forces you to be a little bit more creative when you're packing stuff. It also help you break out of the idea, this kind of notion that a packed lunch is a certain thing. I think that's why I lot of parents get very frustrated and overwhelmed by lunch packing after a certain point, because they feel like they've run out of ideas. They approach it saying, "Well, there needs to be a main course or a sandwich at the center of the lunch, and then there should be ae fruit side and then there should be a grain of ..."
I don't take that approach. I just look in the refrigerator and see what we've got. Sometimes I will pack my son some leftover steak cold, and I will accompany it with some sour cream, and then I'll cut up an apple and I'll smear some peanut butter on that, and then I'll see what else I've got. Maybe it's some leftover pasta, so I'll thrown that in a container too. There's his lunch. There's no main dish. It wasn't built around a theme. It's just bits and pieces that are leftover in the refrigerator. He's happy because he's got variety which kids like and I'm using up leftovers. I didn't have to cook anything. I didn't have to do anything except for throw it in a box. In terms of what you put all those containers in, I'm a big believer in a dual compartment lunch bag, so something that has two separate spots to put food in containers. That way, it's easy to pack hot and cold items. If I put a thermos full of say chili, I want to put that in one compartment of the lunchbox. If I want to pack him a cup of yogurt or some sour cream to go with the chili or some fruit that I want to keep cool, then I can put that in the other compartment. You can put an ice pack in with the yogurt, and then just put the thermos into the other container by itself. It just gives you a lot more flexibility in terms of packing. Suzy Chase : How do you really feel about traditional bento boxes? J. M. Hirsch: Well, you know ... God speed to the parents who have the time and the energy to craft cheese so that it looks like a mouse and to carve radishes into roses for their kids lunches and to capture the essence of their favorite movie cartoon character on the face of a sandwich. I think wonderful for them, good luck with their therapy, but I just don't have the time or the energy to do that. I think these lunches are beautiful. I think they are works of art. I'm not sure why you would then waste works of art on a kid that isn't even looking at it when he or she opens the lunchbox and is babbling away to to his or her buddies and barely focusing on anything, and is eaten in 12 minutes that most kids get to inhale their lunches at school these days. Why you would put that much energy into it, but again maybe there's meds for that. I'm not sure. I'm not a big fan of that much effort. I don't think I ever put that much effort into dinner, but I guess if I'm going to put any sort of effort like that into anything, it's going to be a meal that we're actually sitting down together and enjoying together. Suzy Chase : It's a lot of pressure. J. M. Hirsch: It is, and then it becomes kind of silly where parents are competing and it just gets a little silly. Suzy Chase : Yeah. In Japan apparently it's a big competition. J. M. Hirsch: It's a huge thing because parenting isn't hard enough and there isn't enough competition between kids and families and parents and all this. The social pressure and Facebook perfection and all that. We don't have a enough of that, let's add to it. Suzy Chase : We need a little more. J. M. Hirsch: Yeah, let's add to it. Let's add it to the lunchbox. That sounds like fun. Suzy Chase : Rachael Ray wrote a glowing forward in this book. J. M. Hirsch: She did. Suzy Chase : How did you connect with her? J. M. Hirsch: I've known Rachael because of my day job for many, many years. She switched publishers. She switched to Atria which is an imprint of Simon & Schuster. As part of her switch to them for her own books, she was given an imprint of her own, Rachael Ray Books. She was given the opportunity to select authors that would be published kind of under her banner with Atria. She approached me, and she said, "We've talked over the years." You represent a lot of what she does. In term of the demographic that she speaks to and the sorts of foods I cook and approaches. She asked, "Do you have anything?" This book is actually a product of a blog that I started probably six or seven years ago, and I really had no intention of even doing the blog, never mind turning it into a book. I got the most minimalist blog template I could find. It was white with a photo in the center, and that was it. Everyday I started posting a picture and couple paragraphs describing what I made for my son's lunches. Within the year, I was on NPR. I was on Martha Stewart. Suzy Chase : Oh my gosh. J. M. Hirsch: It was this kind of stupid thing. The whole time I'm like, "Really? It's just my kid's lunches." I really was a bit befuddled by the whole thing, but I guess it hadn't really been done at that level before. Let's not be stupid here. The fact of the matter is I'm sure my job title helped draw a little of attention to what I was doing as well. Suzy Chase : Yeah, jus a little. J. M. Hirsch: I won't pretend it came out of nowhere, but in many ways it did because I just didn't think the subject matter merited any attention. By the time Rachael was getting her imprint, I had been doing the blog for maybe three to four years. Again, I hadn't planned on doing a book about it, but in chatting with her, it was like well gosh, if ever I was going to do a book about it, this is the time and this is the imprint and this is the way to do it. She immediately agreed with my concept of what the book should be, that is should just, very visual and just lead you through easy lunch packing ideas. It just came from that and it ended up being the first book that she published under her imprint. Suzy Chase : Yesterday for my nine-year-old's lunch I made your two-minute stir fry recipe from page 44. J. M. Hirsch: Oh, okay, yep. Suzy Chase : I have to tell you, it was so easy to whip up in the morning as I was doing breakfast. J. M. Hirsch: Yeah. That's the idea. I mean, while I rely tremendously on leftovers, I'm not opposed to a few minutes worth of cooking to transform those leftovers. One thing I would do a lot of times is if I was going to cook something for breakfast, I would somehow use that to make lunch as well. If I was for example making pancakes, I would make enough and then use extra pancakes as bread for sandwiches. I might make a PB and J with pancake bread. Sometimes it's even just a matter of re-using the skillet I used for breakfast. That's the case with this stir fry. If I cooked eggs or something for breakfast, before I would wash out the skillet, I would go to the refrigerator and grab whatever I had handy. That might be leftover pasta. You can actually do a stir fry with leftover pasta too. That's very good. Or, leftover rice. Any leftover veggies or meat I have. Dump it al in the skillet, and toss it around it's hot, crack an egg into it, stir like crazy for a minute and it's done. Pop it into a thermos and you've got a stir fry. Sprinkle a little soy sauce on it and it's good to go. Suzy Chase : Yeah. It was literally like two minutes. J. M. Hirsch: Yeah. Again, that's why I didn't put a recipe with that because you don't need a recipe to do that, and people should just again go to their refrigerator and see what they've got. Maybe I have broccoli, but maybe you have cauliflower, or you have asparagus. I have chicken, but you have steak. Just toss whatever you have in and stir fry it for a minute or two. You haven't even dirtied an extra skillet. Suzy Chase : Since it's the new year, I wanted to ask you what was the best think you ate in 2015, and what food trend can we do with that in 2016? J. M. Hirsch: I did a culinary journey last year. I think it was in May. I circumnavigated the globe eating my way around the world. Suzy Chase : Oh, wow. J. M. Hirsch: Yeah. I spent three weeks just hopping from one country to the next eating and eating and eating. I don't even want to think about how much weight I gained on that trip. My favorite meal, the one that stayed with me most, and I ate it Noma while I was overseas. I ate at all these phenomenal world class restaurants, but my favorite thing that I had was actually it was at a Restaurant Relae in Copenhagen, and it was a risotto, but it was made from sunflower seeds. J. M. Hirsch: Yeah. It was phenomenal and they shaved a cured egg yolk over it, and the grains of the sunflower seeds were so tender and so savory in a way that ... When you make risotto, it gets its savoriness from any cheese that's in there as well as any broth that goes in there. This, it was clearly, it was getting the savoriness from the seeds themselves, and they were so rich and so tender, but they still had that kind of al dente bite that a risotto rice should have, and it was phenomenal. For the trend, I have been calling for this one, and this is the one that gets the pitch forks outside my house. J. M. Hirsch: I have been calling for the death of gluten-free for a long time. There are a lot of Americans who truly have issues with gluten-free products. I'm sorry, I mean with gluten as an ingredient. They have an understandable need and desire for products that are gluten-free, and I wish them nothing but the best. I think that these products have absolutely made their lives easier, and I can totally respect that. J. M. Hirsch: However, there are an awful lot of people running around claiming that everything has to be gluten-free, and oh my God, they are so much healthier, and they weigh less and they do this and they do that. They just glow everyday because they're not eating gluten now, and did you know that gluten is in absolutely every ... For me, one of the low points in 2015 was when I went to the grocery store to grab some potatoes, and the bag of potatoes was literally labeled gluten-free. J. M. Hirsch: I said, "Really? Come on." I don't want it to go away because I understand a lot of people need these products. However, I would like to to simmer down a bit. Suzy Chase : Can I go to the same place with kimchi? J. M. Hirsch: One of the places I stopped on my trip was in Korea, and I ate some phenomenal food. Kimchi has its place, but it's going to be one of those foods that just doesn't take root with middle America. That's a real specific acquired taste, and I have enjoyed it many times, but it's not something I'm expecting to add to the general rotation of my house. Suzy Chase : Where can we find you on the web? J. M. Hirsch: I am on Twitter and Instagram as jm_hirsch, H-I-R-S-C-H.
Suzy Chase : Great. Well, thanks J. M. for coming on Cookery By the Book podcast. J. M. Hirsch: Thanks so much.